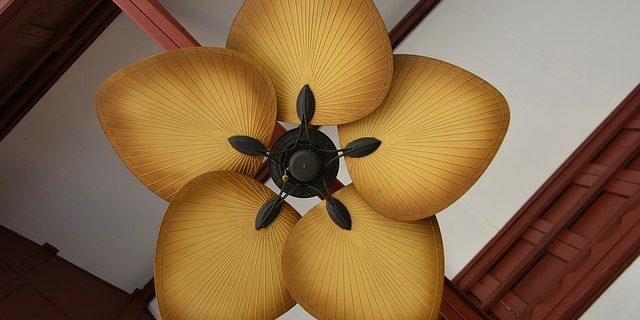 Ceiling fans move air around the room, saving you money on energy bills. In the summer, set the fan to run in a counterclockwise direction, moving cool air around the room. In winter, set the fan to clockwise to draw warm air up from the floor. To move the correct amount of air around the room, you need to choose a ceiling fan based on the dimensions of the room. A room that is 12 feet wide or less should use a 36-inch fan. Rooms that are between 12 and 16 feet should use a fan that is 52 inches, and rooms over 18 feet should install two fans to keep the air moving. Make sure to place the fan seven feet above the floor with the blades spaced 8-10 inches from the ceiling. Choose a fan with five blades and the right amount of power for the size of the room, for the maximum amount of air flow.